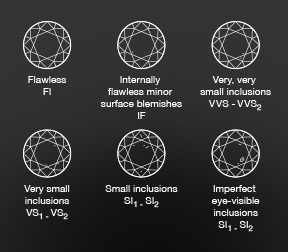 Not only refers to the shape – round, square, marquise or pear for example, it also more importantly refers to the angles, proportions, polish and symmetry of the diamond. The cut determines the fire and sparkle and is graded on a scale from excellent to poor. 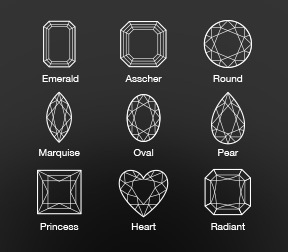 In addition, and perhaps the most important, are the proportions of a diamond. We have years of experience in identifying and selecting quality stones. A keen eye and attention to detail are vital and we know that people can miss the factors which determine value and longevity when they are new to this. We give you the facts based on our experience to help you make an informed decision. 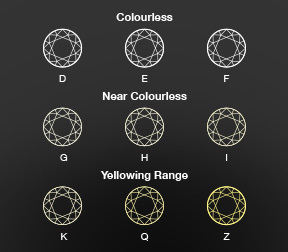 Defines the degree to which a diamond is colourless. The more colourless the diamond, the more valuable it is. The colour scale extends from D (colourless) to Z (light yellow or brown) the purity of colour is easy to spot with our help we recommend and indeed only sell grades D to H which ensures only the best quality. One other very important factor which will greatly affect the value of a diamond is its fluorescence. This refers to the emission of visible light when subject to ultraviolet radiation and should be as low as possible. The five terms for describing the strength of fluorescence range from none, recommended at Williamson Brown, through to strong. 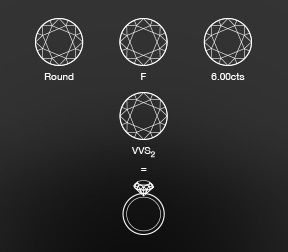 This is the standard unit of weight for all diamonds. The higher the weight the higher the value. However that is not to say big is best and weight should be taken in to account with the other C’s in choosing the perfect stone. This refers to the internal features (inclusions) and surface characteristics (blemishes) of the stone when viewed under 10x magnification. The scale ranges from flawless to I3. Some stones can appear mottled or show inclusions to the naked eye. The combination of other C’s tend to determine the cost which we know is important to any one considering buying a diamond engagement ring. Working with us to determine what is important to you we can help to find a stone whose qualities reflect your budget. 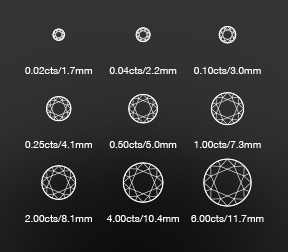 Once we have the stone dimensions we can start designing the engagement ring using the same method as described in our wedding ring section. An initial sketch will be drawn by one of our designers which allows a wax to be carved as a model in your finger size which will be then cast in your desired metal.